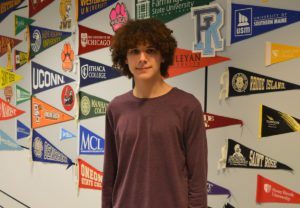 Columbia High School senior Sam Koblensky was recently named a National Merit Scholarship finalist, meaning he remains eligible for one of the 7,500 Merit Scholarships given out nationwide this spring. Mr. Koblensky was named a National Merit Scholarship semifinalist in the fall after scoring in the top 1 percent of the 2018 PSAT/National Merit Scholarship Qualifying Test. Only 15,000 students were named finalists out of more than 1.6 million who took the test nationwide. “It’s a nice recognition,” said Mr. Koblensky, who plans to major in mechanical or aerospace engineering at college in the fall. Mr. Koblensky is one of the top students at Columbia with a 4.0 GPA. He competes on the Columbia Science Olympiad team, which just won the NYS Championship, the Math League team, and plays in the school Jazz Band.